As the Associate Professor of Pediatrics at Baylor College of Medicine, Rally Researcher Dr. Chris Tsz-Kwong Man, PhD is on a mission to improve the diagnosis and prognosis of pediatric cancer patients with osteosarcoma. 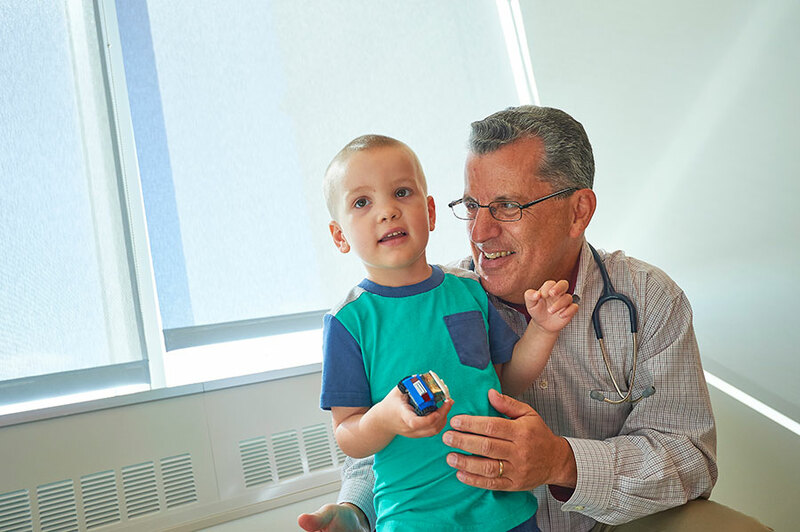 “Despite the advancement in experimental therapy, the survival of patients who respond poorly in pre-operative chemotherapy remains low,” says Dr. Man, a participant in the Bone Tumor Program and the Cancer Genetics and Genomics Program at Texas Children’s Cancer Center. Because of this, Dr. Man’s research is focused on identifying clinically relevant biomarkers and therapeutic targets in pediatric osteosarcoma with the ultimate goal being to develop a biomarker-guided therapeutic approach for osteosarcoma so that high-risk patients can be identified early on and a more targeted and effective therapy can be utilized to treat them. In other words, new immunotherapy approaches to osteosarcoma treatment are helping the body’s immune system fight the cancer with less harmful side effects than traditional chemotherapy. We talked to Dr. Man about what the prognosis and treatment plan is for patients with osteosarcoma, how his research is leading to new and improved therapies, and why funding from the Rally Foundation is vital to his work. Osteosarcoma most frequently occurs in children and young adults between the ages of 10 and 30. Children with osteosarcoma generally develop tumors in their extremities, such as the femur and tibia. Patients who have specific genetic mutations found in rare genetic disorders, such as TP53 mutations in the Li-Fraumeni syndrome or RECQL4 mutations in the Rothmund-Thomson syndrome, or exposure to ionizing radiation, have a higher chance of developing osteosarcoma. The main symptom associated with osteosarcoma is pain that lasts over several weeks or months and gradually becomes worse. Laboratory tests may be used to aid in diagnosis. For example, a high level of alkaline phosphatase in the blood may indicate osteosarcoma. Additionally, radiographs, computed tomography, and magnetic resonance imaging are often used in diagnosis and for detection of metastases. The standard of care for osteosarcoma involves a diagnosis by an initial biopsy, followed by two to three courses of pre-operative chemotherapy. Surgery is then performed to remove the tumor. After that, post-operative chemotherapy based on the initial response to preoperative chemotherapy is administered. Typically, patients who have a good response receive the same chemotherapy post-operatively, while poor responders receive an intensified or alternative chemotherapy regimen in an attempt to counter the chemo-resistance of the tumor. The treatment of pediatric osteosarcoma has not significantly changed or improved over the last three decades. Since the development of chemotherapy in the 1970s, the main treatment remains the same and involves a combination of surgery and multi-agent chemotherapy. Previous studies have shown that modification of post-operative chemotherapy does not significantly alter the outcome of patients with a poor chemotherapy response. The prognosis of osteosarcoma varies depending on its clinical characteristics, such as location of the tumor, initial metastatic status at diagnosis, chemotherapy response, and age of the patient. With current treatment regimens, the overall survival rate of osteosarcoma has increased dramatically over the years to between 60 and 70 percent. However, patients who develop overt metastasis at diagnosis, acquire resistance to chemotherapy during their course of treatment, or develop tumors in other locations have a much poorer outcome with a five-year survival rate of less than 20 percent. Currently, there is no cure for osteosarcoma metastasis. Even with current treatment regimens, a significant number of osteosarcoma patients who have a complete response to the treatment end up relapsing. The survival rate of these relapsed patients is often poor. Aggressive surgical management for relapsed osteosarcoma is often recommended if a second complete remission can be achieved. The use of additional chemotherapy or radiation to treat relapsed patients may have benefits; however, the results are still unclear as it has not been thoroughly explored. With that being said, there are promising developments being made in osteosarcoma research. One of the potential promising areas is the development of immunotherapy approaches to fight against tumors. Since the osteosarcoma genome, or genetic material, is highly scrambled, many neo-epitopes are generated in tumor cells that can be potentially recognized and targeted by current immunotherapy approaches, such as immune blockage inhibitors and Chimeric Antigen Receptor (CAR) T-cell therapies. Over the past few years, exciting developments have been made in immunotherapy, with CAR T-cell therapies being approved in 2017 by the FDA to treat children with acute lymphoblastic leukemia. Further investigations in this direction may lead to promising new immunological approaches for treating osteosarcoma. Another promising approach is to identify targets that are critical for metastatic progression of osteosarcoma. Since metastasis is the major cause of the death in osteosarcoma, identifying targets that can be used to stop dissemination or proliferation of the metastatic cells within the body may lead to novel targeted therapies to improve the survival of patients. In addition, development of non-invasive liquid biopsy approaches to monitor the response to the conventional chemotherapy or development of relapses may help to identify high-risk patients at earlier time points so that alternative therapies can be offered to improve their survival. My interest in osteosarcoma emerged at the Baylor College of Medicine, where I worked on characterizing osteosarcoma transcriptomes. My team and I chose to research osteosarcoma because, unlike the other pediatric cancers or sarcomas, osteosarcoma has a highly rearranged, or abnormal, genome. This key characteristic of osteosarcoma means that developing precision or genomic medicine for this tumor is very difficult. We seek to overcome this challenge by applying multiomic approaches to characterize the whole genomic and epigenomic landscapes of pediatric osteosarcoma through the NCI’s Therapeutically Applicable Research to Generate Effective Treatment (TARGET) consortium. In other words, we are combining powerful molecular and computational methods that work towards improving the diagnosis and prognosis of osteosarcoma patients. Our research mainly focuses on identifying clinically relevant biomarkers and therapeutic targets in pediatric osteosarcoma through genomic and proteomic characterizations of both tumor cells and blood samples collected from patients. We have previously identified a panel of blood-based molecular biomarkers that can be used to predict clinical outcomes of osteosarcoma at the time of diagnosis. Our current research is to further characterize the biological functions of these biomarker molecules in tumor cells and evaluate if they can be used as potential targets for therapeutic interventions. The ultimate goal is to develop a biomarker-guided therapeutic approach for osteosarcoma so that high-risk patients can be identified early on and a more targeted and effective therapy can be utilized to treat them. For instance, we have previously discovered that autoantibodies against the tumor suppressor gene p27 is associated with a poor prognosis of osteosarcoma. Using a variety of experimental approaches, we have shown that the p27 protein is frequently dysregulated in osteosarcoma cells and the mislocalization promotes the development of metastasis in a mouse model. Recently, we have further identified cellular molecules that can be used to target the p27 dysregulation and other metastatic processes in osteosarcoma. Development of chemoresistance is a challenging problem in the current treatment of osteosarcoma. Patients who develop chemoresistance often have a dismal outcome. Previous studies and our initial results suggested that abnormal, non-genetic influences may be linked to the chemoresistance of osteosarcoma. However, the use of epigenetic agents or combinations of epigenetic agents and chemotherapy drugs has not been fully explored. Because of Rally’s support, we were able to investigate the cytotoxic effects of epigenetic agents alone or combined with chemotherapy drugs on osteosarcoma cells. Among the agents and drugs tested, our study showed that epigenetic agents synergistically increased the cytotoxic effectiveness of the chemotherapy drug Cisplatin to kill osteosarcoma cells. Since epigenetic agents have been used in treating human malignancies and diseases, our results provide a potential novel therapeutic approach to combat chemoresistance in osteosarcoma. Testing a combined therapy with an epigenetic agent and chemotherapy in preclinical or animal studies will be a next step in the future. We are grateful for the Rally’s funding to support our osteosarcoma research.